In New Orleans-style jazz, the term “front line” refers to three melody instruments. The first voice or lead melody is usually the cornet or trumpet, though some early jazz bands used the violin. The second voice, or obbligato, is usually the clarinet, but can also be the violin or saxophone. The third voice is most often the trombone. The interaction of the three instruments creates a melodic polyphony, which is in contrast to the solo melody statements of modern jazz styles, which came after New Orleans jazz in the mid-1920s. Collective improvisation among these instruments can involve a three-way “call and response.” The first voice will state a theme or melody, and the second and third voices will then make a melodic statement in response it. The overall affect is a musical conversation, in which the first and second voices respond to one another, and the deeper third voice provides a bass-level counterpoint. Buddy Bolden helped to define the cornet as the dominant melody or solo voice in early New Orleans jazz. Following his mental breakdown in 1907, other local cornetists maintained the prominence of the instrument. Freddie Keppard was considered the dominant cornetist from 1907 till 1915, with Joe Oliver coming after him, from 1915 to 1918. The fact that all three musicians were known locally as “king” of the cornet reflects the instrument’s importance in the development of the style. When Louis Armstrong left King Oliver’s Creole Jazz Band to form his own band in 1925, he expanded the solo abilities of the cornet and trumpet. Whereas Bolden, Keppard, and Oliver were known for their rough and affected sounds (through mutes or wah-wahs), Armstrong developed a more pure cornet and trumpet tone, without affects or vocalization. His sound helped define the more modern jazz of the late 1920s, and was one of the most imitated jazz styles for decades. Armand J. Piron, leader of his New Orleans Orchestra, was one of the few to use a violin as a lead voice in an orchestra setting. However, compared to the cornet and trumpet, the violin’s softer sound made it difficult to hear above the din of the other instruments and dancers, and it gradually faded from the front-line. The second voice, or obbligato, often had the greatest improvisational freedom, and was expected to play highly ornamental variations of the melody (later, in the mid-20th century, it was sometimes called “window dressing”). The role can be traced to Western formal music, in which the second voice was seen as an essential melodic counter-point to the first voice. The New Orleans jazz standard “High Society” provides one of the clearest examples: originally a marching band song, the piccolo part on the trio (third strain) was adapted to clarinet by Alphonse Picou. Brilliant clarinet soloists like Sidney Bechet used the obbligato role to create an endless stream of melodic variations. The trombone sounds in a lower register than a cornet, trumpet, or clarinet, providing a vocal balance to those higher voices. Often, its role was to provide a variation of the bass melody that fit into the spaces between the first two voices. In early New Orleans jazz, the trombone would often slur—sliding from one note to the next—a technique called “tailgating.” The term came from the trombonist’s position on the tailgate of the wagons that bands would play on to advertise for local businesses, where he sat to avoid hitting the other musicians with his slide. In some cases, trombones did play the lead voice, as in the songs “Ory’s Creole Trombone” and “Muskrat Ramble,” composed by Kid Ory, who is considered the top trombonist of early jazz. 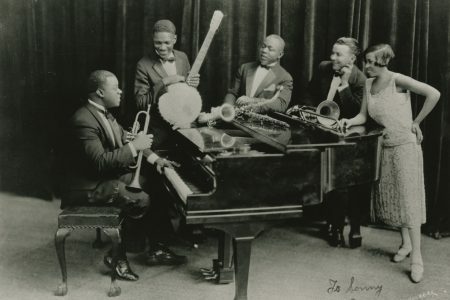 The steady, driving rhythm of early New Orleans jazz—usually provided by drums, guitar or banjo, and piano—contrasted with the polyphony and improvisation of the front line melodies. Pianos were often solo instruments played by great improvisers like Jelly Roll Morton, Tony Jackson, or Manuel Manetta, but in a band setting they often took on a supportive role, with occasional solos. Likewise, the guitar or banjo usually provided a steady rhythm for dancing, but in some songs they were given individual solos. Drummers rarely took solos in early New Orleans jazz, as they were counted on to keep time.